David Zacour has been serving as a Grace Group leader for 1st grade boys throughout this year. He loves being with young kids and sharing Jesus with them! He says that serving with kids that age “reinforces how impressionable kids are” and how important it is that they know the love of God. Building relationships with the kids has allowed him to pray with them and share Jesus’ love. In Matthew 19:14, Jesus says, “Let the little children come to me, and do not hinder them, for the kingdom of heaven belongs to such as these.” David values being a group leader because he is able to follow up with the same kids each week and build relationships with them. He says that when he serves, he “gets back more from the kids than he gives.” One encounter David was given was being able to pray with a boy whose mother had passed away. What an amazing opportunity to share the love of Jesus and go through life with the kids! When searching for a volunteer opportunity, David found an area of ministry that suited his strengths and he has been a faithful leader. At Grace, we love our volunteers and couldn’t do Sunday mornings without them! Our Grace Kids ministry is simple, safe, and fun and we couldn’t make this possible without the dedication of our group leaders and the help of our volunteers. If you’re interested in being a Grace Kids volunteer you can submit an application today. 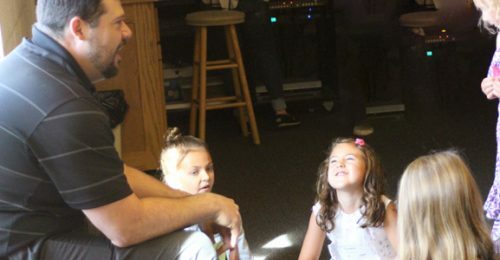 Grace kids is offered all three hours on Sunday mornings, which makes it possible for each child that walks in to experience what God has for them that morning. We love our Grace Kids ministry because kids have the opportunity to hear about Jesus on their level!